In recent years, Israel has become a major player in the field of assistive technology. 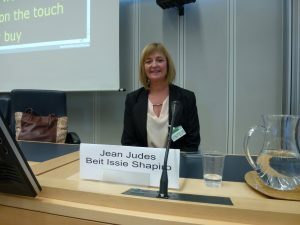 Now, Israel’s success in developing technology for people with disabilities impacts the world, as Beit Issie Shapiro’s executive director Jean Judes was invited to present at a United Nations event in Geneva. On April 19, the Permanent Missions to the United Nations of Germany and Israel, together with the International Disability Alliance (IDA), co-organized a panel discussion at the United Nations, titled “Persons with disabilities living independently and being fully included in society through the use of innovation and technology. In front of representatives from 43 countries, Jean Judes addressed “Technological Entrepreneurship as a Tool to Promoting Full Inclusion and Participation in the Community” and presented the technological ecosystem that Beit Issie Shapiro is helping to establish in Israel to promote and provide support for social entrepreneurship in the field of disabilities. “For people without disability, technology makes things easier. For people with disabilities, technology makes things possible” said Judes. She went on to praise Israel’s excellent academic level, private investors, Government support and vibrant entrepreneurship spirit. H.E Embassador Evyatar Manor, Permanent Representative of Israel to the United Nations in Geneva, said: “Beit Issie Shapiro is a very good illustration of joint-expertise. In Israel, 12% of the population has some kind of physical, sensory, mental or intellectual impairment; and 5% of the working age population – about 200,000 people – have high level support needs”. Sarah Herrlinger, Senior Product Manager for Accessibility at Apple who also presented at the event, said: “Technology makes people become more creative, communicative and independent. Accessible technology helps people with disabilities break free of social stigma”.